Thankyou to everyone for sending in their fabulous photographs from their Easter holidays! The children have talked to us beautifully about their adventures. We really enjoyed hearing all about them! If you would like to add photographs of your Easter weekend, we will continue with this activity next week. Next week, will be our ‘Parents as Partners’ week. However, Grandparents, Aunties / Uncles etc are very welcome to join in! We have planned some short, fun activities for you to do with your child as you arrive in the morning. We will open the gate early (8.45am). Some of our activities will be weather dependent, so this is a rough guide to the week. We will also ‘roll over’ activities as best we can. Tuesday – please return ‘Me and My Family’ jigsaw to discuss in class. Wednesday at 2.30pm – Please bring your favourite childhood story from home to share with your child. For example, I read all the Disney storybooks and my favourite was Bambi. I also enjoyed reading the Puddle Lane books. Thursday – ‘Eat what you want for breakfast’ Day! We will collect the results from Tuesday’s tally chart and provide a little treat for you and your child. Friday – Collect a ‘Random Act of Kindness’ from a teacher to complete at home. Please add to Tapestry where possible. We want our activities to be available to as many families as possible. Please speak to a member of staff and we will be flexible with times. We hope you are all having a fantastic Easter holidays. Please remember to post a photograph and notes on Tapestry of something your child has enjoyed doing during the holidays. Please do this by Tuesday 16th April. 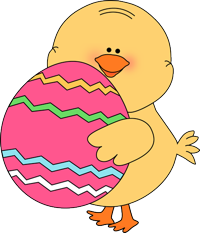 We have lots of exciting activities planned for next week, including: talking about what the children got up to over the Easter holidays, finishing off our crafts activities and looking at different Science experiments! In our mathematics sessions, we will practise recognising numerals and matching them to the correct quantity. The children are singing the phonics songs very well and learning the sounds and actions! So far we have learned s,a,t,i,p,n,m,d,g,o, c/k. We will recap ‘e’. We are practising oral blending, using Metal Mike! If you would like further information, please do not hesitate to ask a member of staff. We have changed the children’s name cards for when they return after the holidays. For the first two weeks, we would like the children to begin by recognising their name. We will be carrying out our parents’ meetings during the first week back after the holidays. Please make sure you have signed up for a time with your child’s key worker. For this half term, a contribution of £2.50 into our piggy bank would be very much appreciated! Our Summer Term Parent Rota is on the Noice Board, please sign up where possible. Next week, we are continuing with our topic, ‘Easter’. We will focus upon writing our names for Easter cards and enjoy various Easter craft activities. We will be baking hot cross buns with Mrs Eastwood and making chocolate nests with Miss Wright! Yum Yum! In our mathematics sessions, we will practise counting actions and objects that can’t be moved and comparing different groups to see whether there is the same or different amounts. The children are singing the phonics songs very well and learning the sounds and actions! So far we have learned s,a,t,i,p,n,m,d,g,o. We will recap ‘c / k’. We are practising oral blending, using Metal Mike! If you would like further information, please do not hesitate to ask a member of staff. On Friday 29th March, you are invited to the school hall at 2pm to listen to the children sing a Mother’s Day song for you! If your child does not usually attend on a Friday afternoon, you are more than welcome to drop them off in the classroom at 1.45pm, so they can show off their song to you! After the holidays our topic will be ‘News’. We would like everyone to post a photograph and notes on Tapestry of something your child has enjoyed doing during the holidays. Please do this by Tuesday 16th April. Please ensure your child has a spare set of clothes in school. It is very muddy and wet outdoors and sometimes the children need a change of clothes. Thankyou to the parents who have brought old clothing in for us to use. If anyone has any old joggers at home, we can give them a good home! Our Parent Rota is on the Noice Board, please sign up where possible. We enjoyed making our collage chickens and chicks this week! Our chicks will feature on our board down the canal. We have read an information book about chicks and watched a video of a chick hatching! In blue group, the children have been learning to use marks to represent amounts in their mathematics sessions. Mrs Hampshire is very proud of their work! Green group have been working on representing numerals in different ways e.g. for 5 – counting out 5, showing 5 fingers, writing the number 5. Super counting green group! Next week, we will start our new topic ‘Easter’. This is such a fab topic and the children will learn the Easter Story. We will talk about the meaning of Easter (new life) and link this to our work on Spring and The Farm. 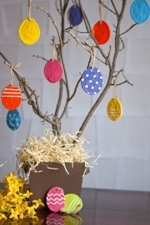 We will make salt dough Easter decorations and take part in some egg rolling! The classroom will have some lovely continuous provision for the children to access; making and decorating an egg in the playdough, finding numbered eggs in our sensory tray, hunting for eggs with messages inside and making bunny ears on our craft table. In our mathematics sessions, we are comparing the length of different sized bunny ears, and also, using positional language. The children are singing the phonics songs very well and learning the sounds and actions! So far we have learned s,a,t,i,p,n,m,d,g,o. We will learn ‘c / k’. We are practising oral blending, using Metal Mike! If you would like further information, please do not hesitate to ask a member of staff. This week, we have enjoyed a range of activities related to ‘The Farm’. A HUGE THANKYOU to Grandad Anth for visiting us on Wednesday morning with one of his chickens!!! He showed us the different food that a lamb needs as it grows (just like babies to toddlers). We LOVE visitors in Nursery, so if you know of anyone, who would like to share their job / hobby / interest with us please get in touch. Next week, we will continue with our topic ‘The Farm’. We will make collage chickens and chicks, focusing on using shapes appropriately for tasks. We will encourage the children to become more independent by modelling the activity and asking them to complete as much of it by themselves as they can. In our mathematics sessions, we are creating symbols to represent ideas of number. We will achieve this by counting farm animals and recording the amount on a tick sheet. This can be a line, a circle or a tick. We will also have a go at forming some of the numerals. The children are singing the phonics songs very well and learning the sounds and actions! So far we have learned s,a,t,i,p,n,m,d,g. We will learn ‘o’. We are practising oral blending, using Metal Mike! If you would like further information, please do not hesitate to ask a member of staff. We find having a water bottle handy in Nursery very helpful! Please ensure your child brings a water bottle everyday (and it must be water, we do have a policy in school). It is fine to send a cordial drink inside your child’s packed lunch box. Also, a bag with spare clothing / a carrier bag / wipes. The next few weeks will be very busy in Nursery. We will make Mother’s Day cards, Easter cards and will be decorating a wooden rabbit to display down the canal! Our Parent Rota is on the Noice Board, please sign up where possible. Thankyou for sharing your pet pictures! These were great to see and to talk about! After the holidays, our topic will be ‘spring’. We will look at and discuss signs of spring. We will plant seeds and talk about what a seed needs to grow. We will make a ‘growing’ collage. The children will look closely at a daffodil and have a go at an observational drawing. Around the classroom, the children will have the opportunity to dig, role-play in our farm shop, make a paper plate flower, sing 5 little speckled frogs and paint with carrots! If you have any bags of soil at home that you would be happy to donate this would be wonderful! In our mathematics sessions, we will be learning to make marks to represent numerals. The children are singing the phonics songs very well and learning to sounds and actions! So far we have learned s,a,t,i,p,n,m,d. The next sound will be ‘g’. We are practising oral blending, using Metal Mike! If you would like further information, please do not hesitate to ask a member of staff. Please do not allow your child to bring toys / jewellery into Nursery. If they want to talk about a toy that forms part of their News please take a photo and post on Tapestry. We do not want toys to get lost or broken and for the child to become upset. Thankyou in advance for your support. The parent rota is up for next half term. Well, our Chinese New Year topic could have gone on for ages! We all loved it! Mrs Eastwood’s spring rolls were a huge hit! If you would like to make these at home…she bought filo pastry from Booths (as it couldn’t be found anywhere else! ), this was cut in half to make one spring roll. She grated carrots, cut bean sprouts and red pepper, then added sweetcorn. This was rolled and folded either end. Mrs Eastwood brushed some cooking oil on the top and put in the oven for 10-15minutes. Thank you for the food shopping and your expertise Mrs Eastwood! Thankyou parents for your contributions to our piggy bank as we would have been unable to make the spring rolls or taste the Chinese food without it. Next week, our topic is ‘What We Love’. With Valentine’s Day in mind, we have a planned activities based on what Miss Wright and I love, which is our dogs! We are asking if the children can bring a photo/s of a family pet on Monday to keep in class all week. It does not have to be a photo of a dog. It could be a cat / fish / guinea pig. The photographs will be used during our speaking activities. If you would like to post photographs on Tapestry by 8am Monday, we can print these for you if needed. Please feel free to add a video for your child to talk about as well. We will make Valentine’s Day cards and practise writing our names. We will focus upon your child’s next step whilst working 1 to 1. We will learn about the story of St Valentine. We will print using heart shapes and print onto a heart using paint and shaving foam. We will read, ‘Should I share my ice-cream?’ and make friendship bracelets. In our mathematics sessions, we will be playing with shapes. We will look at a heart shape and discuss symmetry. We will also investigate other shapes using a mirror to see if they are the same on both sides. Well done to the boys and girls who have brought a bag of objects to represent one of the sounds we are learning! We are learning the sounds ‘s,a,t,i,p,n’. We have also introduced ‘m and d’. We are very happy to be taking part in multi-skills sessions this half term! Our PE lessons are now on a Monday morning and Thursday afternoon. Multi-skills will be on the Monday morning, ensuring the maximum amount of children have the opportunity to take part. The children thoroughly enjoy these sessions. We can keep you updated via Tapestry. Please ensure your child is wearing socks and shoes on these days that they can easily take off and put back on by themselves. We use our PE time helping the girls put tights the right way around and back on; leggings / joggers are fine to wear on these days. We thoroughly enjoyed our sensory week! We hope you enjoyed seeing the photos on Tapestry. 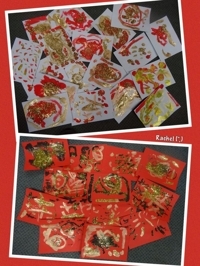 Next week, our topic will be ‘Chinese New Year’. We will be learning about the celebration and talking about similarities to our own lives. There are some great videos on the Cbeebies website if you would like to talk about Chinese New Year at home. We will make a dancing lion puppet, we will mark-make with gold, yellow and red paint. 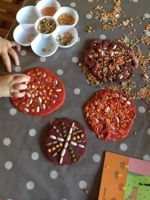 The children will have the choice to make a ‘Happy Chinese New Year’ card, to play in rice, mark-make in glitter and to use tweezers to sort red, black and yellow pompoms. We will make spring rolls and taste some Chinese food. We will listen to the story of the animal race; this is how the Chinese years are organised. 2019 is the year of the pig. In our mathematics sessions, we are matching numeral and quantity using food and solving number problems using padlocks! The children are really enjoying our phonics sessions. Please feel free to add to tapestry items you have found beginning with ‘s’ for example or bring a bag of objects beginning with ‘t’ for the children to show their friends. Maybe practice forming the letters using chalk or finger paints. We are learning the sounds ‘s,a,t,i,p,n’. The parent rota is on our notice board. Please sign up where possible. A huge thankyou to those parents who keep coming back!! We plan to have Monday/ Tuesday as muddy days, Wednesday as a bubbly day and Thursday/ Friday as a ‘What can I feel?’ days. This of course means we will be getting very muddy and possibly wet! Parents are invited to stay on Thursday morning until 9.15am to blow bubbles for us whilst we perform our ‘Bubble song’. We look forward to posting some fabulous pictures on Tapestry. 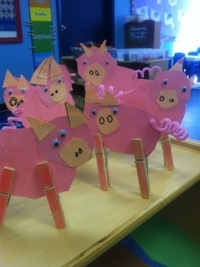 Next week, our topic will be ‘The Three Little Pigs’. We have already started learning our song from ‘The 3 Singing Pigs’ book. I’m sure the children will be happy to perform this to you when we have perfected it! We will add it to Tapestry. Our focus for the beginning of the week will be retelling the story and joining in with the repeated refrains. We will do this as a whole class and also through small group activities using puppets and props. We will also hunt for characters outdoors and create a story map. We will make pig puppets and ‘Wolf Wanted’ posters. In our mathematics sessions, we are learning when something is added or taken away the amount changes. We are practising counting forwards to 20 and also backwards from 10. We will use a piggy and wolf voice. We will also teach the pig and wolf how to say number names in the correct order. We are very happy to be taking part in multi-skills sessions this half term! Our PE lessons are now on a Monday morning and Thursday afternoon. Multi-skills will be on the Monday morning, ensuring the maximum amount of children have the opportunity to take part. The children thoroughly enjoy these sessions. We can keep you updated via Tapestry. Please ensure your child is wearing socks and shoes on these days that they can easily take off and put back on by themselves. The parent rota is on our notice board. Please sign up where possible. We have had a fabulous first week back! We have been talking about winter and the signs we might see in the environment, such as frost and ice. We made ice-cubes and watched them melt. Look out for our super bird feeders hanging in the Nursery playground and also our handprint snowflakes, collage penguins and melting snowmen in the classroom. We will introduce Antarctica and watch a penguin video. Next week, we will continue with our winter theme and learn more about Antarctica. We will bake some shortbread biscuits and decorate them. We will read “Lost and Found” by Oliver Jeffers and talk about how the boy feels in the story (here’s a youtube video to watch at home https://www.youtube.com/watch?v=FSUISgOa02s). We are beginning to link letters to sounds in our phonics sessions. So far, we have learned ‘s’ and ‘a’. We will continue with ‘t’ and ‘p’. I found this video very quickly by typing in google “jolly phonics s” https://www.youtube.com/watch?v=ybiJTZNLvTI if you need more information of how we say the sound and also the actions to match. The children have really enjoyed this and we would encourage you to practise at home. Tuning into initial sounds in words helps children massively when they begin to spell words, firstly verbally and then during writing activities. If you need any more information please do not hesitate to speak to a member of staff. In our mathematics sessions we are focusing on pattern. We will look at the patterns we find on our socks and read the story, “Aliens Love Underpants”. Thankyou for your Tapestry photographs and videos for our reading display. We have enjoyed sharing these in class! We have ‘Nursery News’ every Monday and Wednesday, so please continue to add your exciting adventures over the weekend. The children particularly loved the videos! Thankyou for all your contributions to our piggy bank! For the next half term, please add £3 where possible. We play outdoors even in very cold weather, so please ensure your child is wearing a warm coat, a hat and gloves. Week Beginning 7th January 2019! Welcome back to school! We hope you have had a fantastic holiday with your little ones and they are ready to begin our spring term. A photo or video of your child reading their favourite book, or singing a favourite rhyme or song. A photo or video of you or a sibling sharing your child's favourite book, or singing a favourite rhyme or song. We look forward to sharing these in class on Monday 7th January 2019! This week, our topic is ‘Winter’. Hopefully, we will spot some signs of winter outdoors. We will be making ice cubes and then watching them melt. There will be lots of talk during these activities about what is happening and why. We will be mark-making with coloured ice cubes, breaking out small world toys from large ice cubes, melting a snowman, making bird feeders and sorting summer and winter clothes. The children will watch a video clip about animals that live in Antarctica (mainly the penguin) and create a collage; focusing on using scissors correctly. A very busy, but lovely first week back! Thankyou for all your contributions to our piggy bank! For the nex thalf term, please add £3 where possible. Drum roll please!!!! We have raised £215 from our ‘Go for a Ride Day’!!!! This is an excellent achievement, thankyou very much! We will show off our purchases as soon as they arrive. This week, we have read ‘The First Christmas Story’. The children are really enjoying learning about baby Jesus, Mary and Joseph. We have talked about where baby Jesus was born and how the kings followed a very bright star. We have started making our Christmas cards that look absolutely fabulous and also our calendars. We have been practising our singing in the hall too…AND, of course, exploring our new role-play area (which is still called the 3 bears house by some and Santa’s World by others). If you have any old Christmas wrapping paper or small cardboard boxes / kitchen rolls please bring into class so the children can wrap them until their hearts are content! Next week, will be a very busy with our plays. If your child does not usually attend Nursery during any of these times you can drop them off in the classroom at 9.45am (Mon / Tue) or 1.45pm (Wed) and collect them when the play has finished from the Nursery playground. Please inform a member of staff if your child will be part of the play and who will be collecting them. THIS IS ONLY FOR CHILDREN WHO WILL BE EXTRAS ON THE DAY. Please can we also ask that adults give a big smile and a wave as the boys and girls walk back to class and then exit through the hall / main entrance door once the play has finished. It can get very busy if adults follow the children back to class and it is imperative that the children are safe at all times, leave with the correct adult or stay in school. We understand it is very difficult, but we have to place safety first. All details about costumes can now be found on our schools website under ‘Nursery News’. We will put a ‘wish list’ for our party food / drink on a clipboard outside very soon. Unfortunately, we cannot give a class list to parents who wish to write Christmas cards from their child due to recent changes in data protection laws. If you wish to send cards with blank envelopes, stating ‘from ….’ we will hand these out in class and keep any spare for children not in on that particular day. Thank you all for your fantastic support; raising money for outdoor equipment! We have raised £127! This week, we have produced some fabulous name trains! The children have followed instructions very well and I’m sure you can see via our Tapestry posts how hard the children have tried with their name writing. If you would like any further advice, with regards to name writing, please do not hesitate to speak to a member of staff or make an appointment. We have started making our snowflake hats for the Nativity too! Next week, we will begin our count up to Christmas. We will open our advent calendar every day to find a picture relating to the first Christmas story. This is a great way to teach the children about the origins of the celebration and to also think about the importance of giving presents. We will read, retell and sequence the events of the first Christmas story. We will make our Christmas cards and to write our names inside. We will spend time sharing books around our theme and (fingers crossed) our new role-play area will be up and running! If anyone has any old wrapping paper they would be happy to donate, this would be gratefully received. During our phonics sessions, we will play ‘Rhyming Soup’ from the Letters and Sounds document. We have had such a busy week! The children have thoroughly enjoyed our story ‘The Journey Home from Grandpa’s’ as you can tell from our Tapestry posts. We have enjoyed seeing the children’s vehicles from home too. We have managed to complete our maths activities and have enjoyed some lovely continuous provision outdoors. We are looking forward to our ‘Go for a Ride’ Day tomorrow. Please return all sponsor forms and money by Monday 3rd December. Next week, we will finish our name writing on a train. Then, we will begin preparing for our Nativity! The children will make their own hats in class. We are all going to be snowflakes. For the performances on Monday 10th Dec and Tuesday 11th Dec at 10am please can the children arrive at school dressed in black pants / joggers or leggings and wear a white t-shirt with school shoes. Please send a jumper or hoody to put on afterwards if your child is staying in school. For the Wednesday (12th) performance at 2pm, please can the children bring their pants / joggers or leggings with them to school (in case of spillages etc before the performance) or if you have a spare pair send those. It is probably safe to send them on this day wearing their white t-shirt under any top that they can easily take off and put on by themselves. This would be really helpful for us when getting the children ready for the performance and also afterwards for home time. Please ensure all items of clothing are named and your child only comes home with their own clothes. If your child does not attend Nursery on these days / times and you would like them to take part in the Nativity please let a member of staff know. You can drop your child off in the classroom before each performance. Further details for performances have been posted on the ‘School Story’ via Dojo by Miss Jackson and Mrs Procter. I hope this makes sense! Please ask if you are unsure. We have booked our Christmas Party for Wednesday 19th December between 9am-12pm. If your child does not attend on this day, we would love them to take part. Just let us know. We will put a ‘wish list’ for food / drinks out nearer the time. We will also have a special visitor at 11am, which you / Grandparents are invited to come and watch. Next week, we will read ‘The Journey Home from Grandpa's'by Jemima Lumley. You can watch an animated video of this story on https://www.youtube.com/watch?v=wKcrsv_t8Ko. We will discuss the vocabulary used in the story to describe the vehicles and paths they go along. We will learn the song too! The children will be encouraged to talk about journeys and vehicles they have been on. We will make a vehicle collage using shapes and ask the children to name and describe the shapes they have chosen. The children will practise counting people onto a bus and will find the correct numeral to match. Our mathematics activities are very much embedded into the adult-led and continuous provision we will provide this week. We will practise writing our names on a train! The children will be supported in recognising their name, using the correct pencil grip and controlling the pencil to form the letters. If they are ready, we will teach the correct formation of the letters. Early writing has many processes, before it turns into recognisable letter formation. We would be happy to discuss any of this with you so you can support your child at home, just ask! For this week, the children are invited to bring a vehicle from home to talk about during Nursery News and to use when making tracks in the paint and car washing. If your child wants to talk about their favourite vehicle during News and use a different one to go into paint and water that is fine. Please put the favourite vehicle on the teacher’s desk in the morning and the other in a named carrier bag on the child’s peg to keep in class for the week. We will try our very best to keep all toys safe, however accidents do happen so please don’t send an expensive toy. On Thursday 22nd November, we will be taking part in ‘Go For a Ride Day’. Further information can be found on https://www.daysoftheyear.com/days/go-for-a-ride-day/ and https://nationaltoday.com/go-for-a-ride-day/. This year we are asking families to sponsor the children in riding for 30 minutes during the day. This will help to raise much needed funds to improve our outdoor area. You should have received a sponsor form. The children are invited to bring a bike, scooter or dolls pram from home to take for a ride in our big playground. As the playground is bumpy in parts, the children will need to wear a helmet to take part in a riding activity. This is such a fun week! We can’t wait! We have loved this week learning about Guy Fawkes and Bonfire Night safety. We have been busy making bonfire pictures, firework art, 3D rockets and biscuits. Next week, we will be reading a traditional story ‘The Gingerbread Man’. Our focus will be re-telling the story, using repeated refrains; “run, run as fast as you can…” We will use puppets and masks to help us get into character. We will bake gingerbread men and go on a gingerbread man hunt around the school. During our mathematics activities we are focusing upon accurate touch counting and matching numerals to amounts. We also have a fun gingerbread man action and counting activity to take place outdoors. We do repeat certain aspects of the Early Years Development Matters in Nursery to ensure children are secure before moving on and to also extend a particular aspect further. In our phonics session we will be playing ‘finish the rhyme’. We will ask the children to say the last word to well-known nursery rhymes such as “twinkle, twinkle little…” and introduce the idea of words that rhyme (or sound the same). On Friday 16th November, the children are invited to come into school wearing their pyjamas and to bring £1 for Pudsey. Just a reminder that currently, our PE sessions are running on a Tuesday afternoon and Thursday morning. Please remember to send your child in socks and shoes they can easily take off and put back on independently. We are still working on our independence skills. Thankyou very much to those who have shared via Tapestry their child’s successes! It is so lovely to see! Thank you to those parents who have made their contribution of 50p per week. This will pay for baking ingredients, food tasting and also for play dough. We would be unable to enjoy such a range of activities without your help. Our Parent Rota is filling up! Excellent! We can always do with an extra pair of hands. We hope you enjoyed coming in for your child’s first parents evening! We appreciate your feedback. Lots of children are really enjoying school as much as we enjoy teaching them! Your child's 'Next Steps' will be added to Tapestry by the beginning of next week. Please can we also ask that if you have any further questions or concerns you speak to a member of staff. We have an open door policy and are always happy to chat at the end of the day or alternatively make an appointment. What a great week back! We have been learning all about Divali! We have read the story of Rama and Sita and watched clips on Cbeebies showing how children and their families prepare for Divali. We have talked about our celebrations; when we light candles and put up decorations. It has been fantastic to see the children have a go at making Diva Lamps, tasting Indian food, making Rangoli patterns and learning a traditional Indian style dance. We hope you have gained a good understanding of our week via Tapestry. Next week, we will be learning about Bonfire Night safety and the history of Guy Fawkes. It would be lovely to see photographs of your child watching the fireworks. We will talk about these on Tuesday morning. During the week, we will create bonfire artwork, make rocket models and decorate biscuits! Through our topic, we will focus upon speaking; using language to share experiences, to speak clearly and in complex sentences. During our morning activities we will recap the names of 2D shapes (circle, triangle, square and rectangle) and use mathematical language to describe them. We will spot these shapes in pictures and when constructing our rockets. In our phonics sessions, we will play “Noisy Neighbour” from the Letters and Sounds document. This game requires the children to listen carefully to a variety of sounds and to identify them. Next week is parents evening - Mrs Hampshire’s blue group is on Tuesday 6th November and Miss Wright’s green group is on Wednesday 7th November. You are invited to our Open Afternoon on Tuesday 6th November at 1.30pm. If you would like to collect your child from Nursery and take them on a tour around the school, please report to the office. The school council are looking forward to showing you around our fabulous school! Please pass on the date and time to anyone you know with a younger child starting Nursery or Reception in 2019. Please remember to add and work on an independent skill with your child and upload them to tapestry. We would love to see lots of children achieve this! Thankyou to those parents who have made their contribution of 50p per week. This will pay for baking ingredients, food tasting and also for play dough. We would be unable to enjoy such a range of activities without your help. The Parent Rota is on the Notice Board for this half term. We have enjoyed having parents with us during a session. If you can spare a little time, this would be much appreciated. The Christmas performance dates for Nursery and Reception will be on Monday 10th December for grandparents at 10am, Tuesday 11th December at 10am and Wednesday 12th December at 2pm for parents. There will be 1 ticket for a grandparent and 2 tickets for parents. Tickets will be available from Monday 3rd December. Any spare tickets will be available on Friday 7th December. We are planning our Nursery Christmas Party on Wednesday 19th December in the morning. If your child does not attend nursery on this day, then we are more than happy for them to attend the party! We will confirm this date nearer the time. The children can wear party clothes and will have a special visitor around 11am, where parents and grandparents are invited to come and watch too! We can’t believe how quickly this first half term has gone. We have had a great time settling in and doing lots of fantastic activities too! We would like to apologise for the issues we have had with tapestry recently. We are aware it is still not working and are in the process of sorting it out. Hopefully, it won’t be too long until it is back up and running. Please let us know during the first week of half term if your child needs any extra sessions in nursery. The deadline will be Friday 2nd November. Please ensure you have booked a time for parents evening. The signing up sheet will still be available before and after school. Mrs Hampshire will be carrying out parents meetings with the blue group on 6th November from 3.10-6.10pm. Miss Wright will be carrying out parents meetings with the green group on 7th November from 3.10-6.10pm. Thankyou to those parents who have made their contribution of 50p per week to our piggy bank. This makes a huge difference to us! Next half term would be £4 if you would like to pay in one amount. After half term, we will be learning all about ‘Divali’. This is a fantastic celebration for the children to learn about and we have some amazing activities that surrounds it. We will be reading the story of 'Rama and Sita, making salt dough diva lamps, printing rangoli patterns, cutting and decorating lanterns, tasting Indian food and making barfi sweets. Over the holidays, please remember to work on independent skills with your child. We would love to see lots of children achieve this! We all hope you have a great October half term and see you all after the holidays. This week we have enjoyed an Autumn walk. We found conkers, apples and lots of different coloured leaves. A reminder that we are making leaf sun catchers on Friday 12th October, so it would be great if your child could collect some leaves from their garden or on their own autumn walk. Thank you! Once your child has achieved this please let us know! Mrs Hampshire will be carrying out parents meetings with the blue group on 6th November from 3.10-6.10pm. Miss Wright will be carrying out parents meetings with the green group on 7th November from 3.10-6.10pm. This will be a short 10 minute chat about how your child is getting on in nursery and their targets for the upcoming term. We will have a signing up sheet outside at home time this week to book a time slot. Please remember Nursery News is on a Monday and Wednesday and you can add photographs to your child’s Tapestry account. Unfortunately, we have to change our PE slots on a Tuesday and Thursday. PE will be on Tuesday afternoon and a Thursday morning. Please remember to send your child in shoes they can easily put on and take off. We have had a fantastic week so far learning about our topic all about bears. Throughout the week, we will have learnt lots of different facts about them and have made some fabulous paintings. We have also been learning our ‘5 Bear’ song and creating our headwear for the Harvest Festival, which will take place on Thursday 18th October at 10am. A reminder that our ‘Teddy Bear Picnic’ will take place on Thursday 4th October, where the children will be invited to bring a teddy from home to bring with them. Next week, our topic is ‘autumn’. On Monday 8th October we will be looking at the changes that happen in autumn during our walk around the school grounds. Please could you make sure that your child has a pair of wellies in school on this day. We will also be collecting things from our walk that we can look at that show us we are in the autumn season. 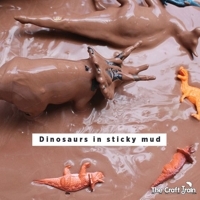 There are lots of fun craft activities planned surrounding this topic. This includes: leaf printing, making leaf people, painting hedgehogs and creating sun catchers. It would be great if the children could bring in leaves from their garden at home to use for our sun catchers on Friday 12th October. During our math activities we will be reciting numbers in a sequence by counting in different ways, for example singing, clapping and using instruments. Thank you to the parents that have already signed up to our parent rota. It is still displayed on our notice board so please still sign up for when you’re available. What a fabulous week so far! The children really enjoyed investigating the 'crime scene' we set up. Of course, Goldilocks was 'told off' for messing up the 3 bears house. We are working on re-telling the story, 'Goldilocks and the 3 bears' using props. It would benefit your child if you could read or tell this story at home. There are many variations of the story, but the main focus for us is the repeated refrains - "Who's been eating my porridge" etc. Our PE sessions will start on Thursday 27th Sept in the afternoon. We take half the class into the hall, then swap over. We ask the children to take off their shoes and socks. At the end, the children are expected to have a go at putting their socks and shoes back on. Please encourage your child to practise this at home. The more children that can do this by themselves, the longer PE session! Next week, our topic is 'bears'. We will be looking at videos and photographs of real bears and talking about how they look, what they eat and where they sleep. We will talk about their special qualities and think about our own. We will paint a bear picture and bake biscuits. During our maths activities, the children will be learning the names of 2D shapes - circle, square, rectangle and triangle. If you spot any of these shapes at home, please share through Tapestry. On Thursday 4th October, the children are invited to bring a teddy bear from home into school. They will be going on a teddy bears' picnic. The children will go onto our field, during the morning, and enjoy their home (school) made bear biscuits and cookies! They will also have time to play on the climbing equipment. If the weather is bad, we have use of the hall on a Thursday afternoon. So it would be biscuits and PE! Please ensure our piggy bank is topped up with a contribution of 50p per week, so we can bake as many biscuits as possible, yum! We will display our 'Parent Rota' on our Notice Board. Please sign up for a date and add the time you are available e.g 9am-12pm or 12.30-3pm. It maybe that you can help out for an hour one morning, which would be fabulous! A BIG THANKYOU to everyone who has contributed to our piggy bank! You will be able to see the children's fabulous self-portraits in class and photographs on our hall display. We will start short PE sessions in the hall on a Tuesday morning and a Thursday afternoon. Please ensure your child is wearing socks and shoes they can easily take off and put on by themselves. Please do not send your child in tights on these days. Black leggings / grey pants and socks is perfectly fine! Next week our topic is Goldilocks and the 3 Bears! We will be focusing upon retelling the story, using repeated refrains "Who's been eating my porridge". We will use a deep voice for Daddy bear, a high voice for Mummy bear and a squeaky voice for Baby bear. We will investigate the 'crime' scene, make wanted posters, sing the song, make bear masks, eat porridge and make bear bread! During our math activities we will be using the language big, medium and small. We will also sort toys into the correct groups. Your child will also write an invite to their bear asking them to join in a teddy bears picnic. Phew! We have a busy and fun week ahead. The children are thouroughly enjoying their lunchtimes too! Please ensure you send a full set of spare clothes (including socks) to nursery. As you will have realised by now, we like to get mucky! We have thoroughly enjoyed getting to know the children this week! They have settled into our nursery routine very well. Next week we will open the gate at 8.50am to bring the children into class gradually. Please support the children in collecting their name cards, hanging up their coat and placing their water bottles at our drinking station. The packed lunch trolley is next to the entrance door. Once they are sat with a member of staff, a quick goodbye helps us get started with our day. Please be prompt arriving in the morning by 9am and also for collection times at 12pm or 3pm. We have a very exciting week planned next week. We will continue with our ‘All About Me’ topic. The children will paint a self-portrait and also make a pizza face to eat for their tea! We will also start ‘Nursery News’ on Monday and the children will have another opportunity to share news on a Wednesday afternoon. Please start adding photographs to Tapestry. Our class bear ‘Stitch’ will also come home with our ‘Star of the Week’, usually on a Friday. This is awarded to a child who has impressed us the most during the week. Thankyou to those parents who have made their contribution of 50p per week to our piggy bank. This will pay for baking ingredients and also for play dough. We are close to completing our new digging area; so please send a pair of wellies to keep in class. This will be the last call for your child’s ‘Hopes Leaf’, which will be displayed in the porch. Welcome to Nursery! This week, we will be focusing on 'settling in'. We will show your child where to find their name card and peg. You will also know your child's group (either blue or green) and where they will sit in the morning for our register. Although, this sounds very formal, it isn't! We make our morning activities as fun and engaging as possible. Our register is very much a celebration of the children in our class and getting to know eachother. Our first topic is 'All About Me' as you will have noticed from our environment during the stay and play sessions. So, please start adding photographs onto Tapestry. Every child will recieve 'My First Day' observations too. If you have any difficulties logging on please do not hesitate to ask any member of staff. Please ensure you name EVERYTHING your child brings to school. They will need a change of clothes, a water bottle and wellies everyday. If your child is staying for lunch please send a named packed lunch bag or order through Lunch Shop. Please also inform us ASAP if you need to change your child's hours (by 17th September). We will keep any changes thereafter on a half termly basis, unless otherwise arranged. We look forward to another exciting year! Unfortunately, there was a mis-type on our induction week paperwork. During the week beginning 10th September each child was offered 3 x 2 1/2hour sessions. The timings for the morning sessions are 9am-11.30am and for the afternoon sessions 12.30pm-3pm. The paperwork stated 1.30pm-3pm. I apologise for any inconvenience caused, but want to make sure each child can access 3 x 2 1/2 hour sessions. The stay and play sessions are Thursday 6th and Friday 7th September 9.45am - 11.15am or 1.15pm - 2.45pm. Please do not hesitate to contact me via email if you have any questions.